Good tour, not sure the guide knew where to take us and how long for, but we had done our research and knew what we wanted/should be seeing (good travellers tip). We were left to wonder around the sights ourselves which was fine. Great tour to see the sights and sounds of the city. !!! Our tour guide, Allan, was young, knowledgeable, and enthusiastic. He started the day asking us what our expectations were and if there was anything specific we wanted to see and spend time on. We really had a blast on this trip! Old Delhi was incredible, and we enjoyed taking in all the sounds and smells! 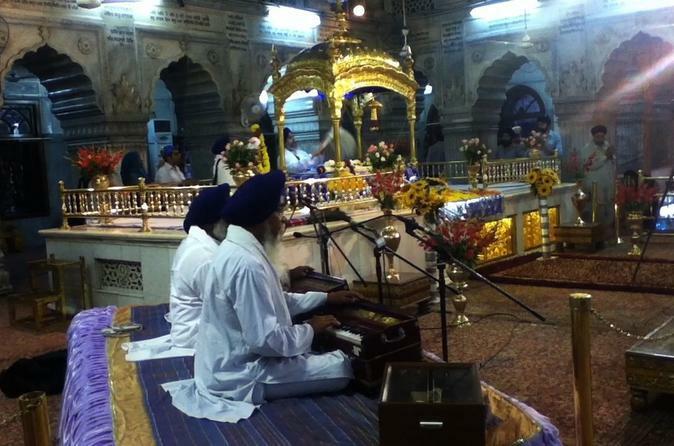 Perhaps my favorite experience was going to the Sikh temple and visiting there for meditation. It was the perfect mixture of excitement and relaxation. Do not miss this tour--it helped bring us cultural knowledge of this beautiful country. This was a great trip the guide was exceptional and very knowledgable. Went to areas I would probably not have gone to you. Very prompt pickup from my hotel the guide and driver were actually both early, arrived at 0830. My guide was very knowledgeable, but not overly talkative. We went to many of the big ticket tourist places, starting in Old Delhi - Jama Masjid mosque and the Red Fort. Along the way, he took me to several temples Jain and Sikh, which I wasn't expecting but was very culturally interesting to learn about. We walked through Chandi Chowk and stopped at a spice market it seems to be a designated tourist stop, quite a few europeans were in there. I didn't feel any pressure to purchase anything, although of course I did. We traveled to these places on both bike rickshaw and electric rickshaw, both of them being fun experiences but probably not for the faint of heart :. They do a flyby drive by India Gate and the Parliament House at some point, but caveat is that there's a lot of smog and combined with fog, so it's actually not that interesting imho except for hearing about the historical elements. In New Delhi, we saw Humayun's Tomb and the guide / driver were flexible and took me to places that weren't on the prescribed list. I wanted to see a Hindu temple so he took me to Akshardham, which is a little bit of a drive away. HIGHLY recommend it, it's absolutely gorgeous and breath-taking. We also went to Lotus Temple Bahai, huge and also not on the original list. Because of this, I didn't go to Qutub Minar, Laxminarayan Temple or Raj Ghat which I didn't mind one bit. I would like to see Laxminarayan, but I can arrange that myself since it's near Connaught Place. The other thing I wanted to do was end up in Janpath, to shop a little. Also not on the prescribed list and the guide did warn me that authenticity isn't guaranteed even at Cottage Emporium, but was agreeble to take me anyway. They stayed with me patiently and overall, I ended the day at 6:00 or so, when the day I think was supposed to end at 5 pm and got to see some areas, do things that weren't their normal routine. The other thing that wasn't routine is that I only eat once or twice a day, so we didn't stop for a proper lunch and I think my poor guide / driver were starving at some point. They did not complain at all, and we got a snack at Akshardham around 3 pm, so I feel badly about that and made sure to warn my guides on subsequent tours! As a female traveling solo, I felt safe with no pressure or annoyance from them despite change to plans, and didn't feel they took me to places that pressured me to buy stuff. They also discouraged beggars / peddlers, which I've heard from friends had annoyed them to the point of ruining some of their experiences I actually didn't see that many of them. I would totally book with them again and trust their ability to deliver! With a personal guide for just the two of us, what a wonderful way to experience the city and not get lost while you look around and try to figure out just where are we. Plus you can have all the say in what you want to see and not what they want you to see. A long day but a great day. This is one of the tour that we experienced India! We walked the busy street of Chandini Chowk, tried their delicious street food - Jalebi and Samoosa, bargained from the shops and rode the rickshaw. 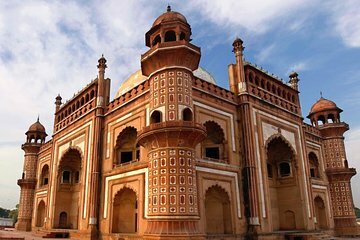 The Humayun's tomb and the Red Fort are very rich in story. We were just a little disappointed as there are 2 sites were on the list that they did not take us to. Excellent tour had time to check out many more places like the Lotus Temple. Great guide who had full knowledge of many places we passed by. The guide is very nice and is quite knowledgeable. Must not forget the driver whom is sometimes forgotten in these reviews. A very nice guy. Really good. The tour guide and driver were very nice and flexible. I was given a choice of what i wanted to see. They also took me to couple of craft shops.